Yep, that's me. Some self praise here, heh. Wrote many reviews and increased the amount and quality of articles here on the site. Took over RPG-O-Mania after I gave it up and put much effort in this site. 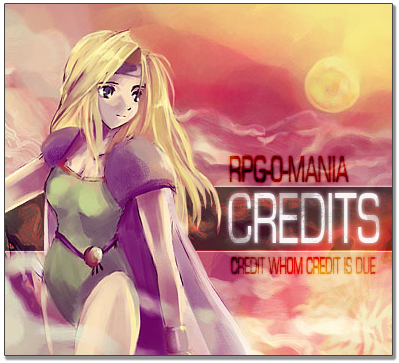 Put rpg-o-mania to the next level by creating RPG xanadu. It's a shame the project died. The man behind, creator of the fourth generation rpg-o-mania and still a good friend. Another techincal genius with lots of constructive ideas throughout the whole lifecycle of rpg-o-mania. The first staffer, still unforgotten. Kept the early forums alive and submitted great Suikoden wallpapers and more. Guy Quebecois, emulation fan and reliable staff member. Ambitious to the core, just stupid me wasn't as ambitious those days. Good guy who submitted tons of self made wallpapers. Staff member who submitted lots of articles, not to mention that he's a dang reliable friend. A good friend, always helped me with this page when I needed his opinion. A pretty cool guy with lots of good ideas. Dedicated Shining Force fan, he helped me develop these sections. Metalhead from Finland, talented tracker and supporter of the page. The webmaster of former game-place.com, also had many words of advice for me. The webmaster of rpglair.com, a good friend with lots of motivating ideas. A cool guy from Austria who always has some... umm... kind words for me. Claimed to be an Italian girl and submitted lots of art. Sent a nice translation for the Seiken Densetsu 3 intro section. Great midi composer, sent lots of his works. Helped me to improve the design, not to mention that he's a good friend. She was one of the first people to help me improving rpg-o-mania by giving some good advice. Webmaster of the incredible "home of classic role playing games", gave permission to use some of his great works. Webmistress of the Shining Force Central, gave me certain hints about the page and created the opportunity to meet my good friend Bowie. For reading this and appreciating the work of many people. Thanks for reading. Thanks to all the people who worked with me to have this page up and running! Let's keep rpg-o-mania going on for many years and expand this list!